Breaking even in California in the Paloma Valley Winter Shootout, Boulder City High School boys basketball finished its holiday slate with a 2-2 record. Robert Vendettoli/Boulder City Review Boulder City High School junior forward Derrick Thomas soars through the air over a pair of Virgin Valley defenders during their Dec. 14 game. Thomas scored a season-high 29 points in the Eagles' Dec. 29 80-62 victory over San Jacinto in the Paloma Valley Winter Shootout in California. Playing against stiff competition, the Eagles are confident their California trip will help prepare them for the second half of their regular-season slate, where they look to end a three-year postseason drought. Starting with a 55-42 win against Valley View on Dec. 27, junior forward Karson Bailey led the way with an all-around performance of eight points, nine rebounds and five blocks, while junior forward Derrick Thomas scored a game-high 15 points and freshman forward Ethan Speaker scored 10. Coming on strong in his first season with the Eagles, Speaker scored 11 and 13 points, respectively, despite losses to Paloma Valley (72-67) and Lakeside (62-54), along with eight points in a 80-62 victory over San Jacinto. Freshman Forward Matt Morton also provided an impact with nine points against Paloma Valley and seven points against San Jacinto. Providing the Eagles with quality scoring options in their win over San Jacinto, Thomas scored a season-high 29 points, while Carson Balistere scored 20 points, including three 3-pointers. 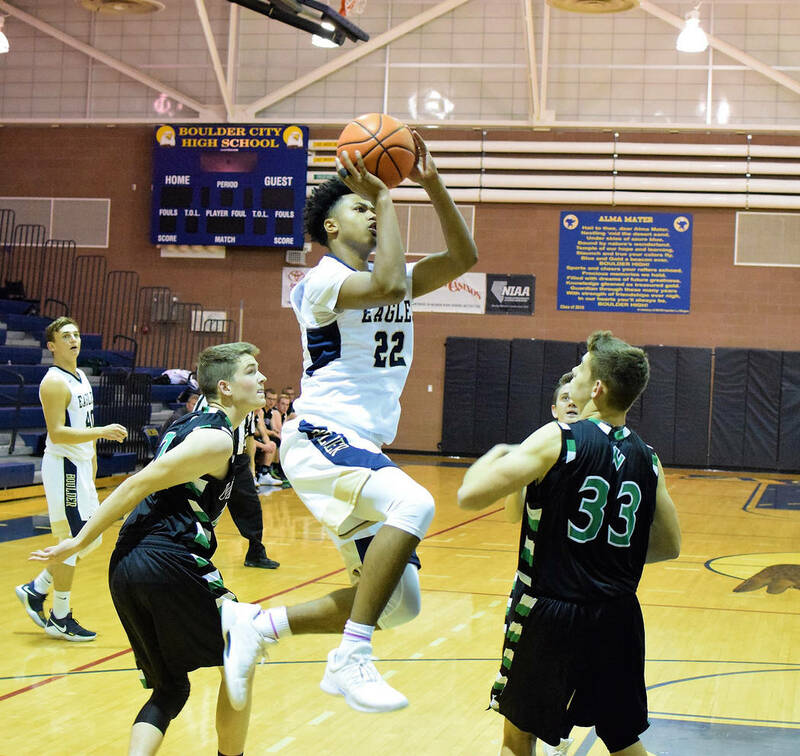 Hoping for similar results from their offense, the Eagles will be tested early when they travel to Pahrump Valley and Southeast Career Technical Academy on Monday and Wednesday, respectively.